My first experience with Buddy Rich was in my as drum room/bed room as a kid in high school, in 1959, listening to the recording “Hi Fi Drums” on a 33&1/3 vinyl LP that my parents had given me to go along with a new "Hi Fi” portable record player that they had also given me as a Christmas present. Buddy was on the first track followed with a track each by: Louie Bellson, Chuck Flores (brushes) - Alvin Stoller - Stan Levy - Irv Cottler - Dave Black. It was a drum extravaganza and everybody sounded great. Up until that time I had been playing country music in country bars and teenage rock recording sessions at Ramsey's studio in Phoenix Arizona. The first time I heard Buddy live and in-person was in 1961. I had moved to NY City to study drums at Adler’s drum shop and to hopefully play as much as possible while I was there. I finally got a gig with an Italian guitar trio in a bar in the Bronx 10pm to 4am. However, almost every Monday night I hung @ The Jazz Corner of the World ‘Birdland’ (with the equally famous Pee Wee Marquette as the ‘Birdland’ announcer). It was there that I heard so many great players, groups and drummers and witnessed for the 1st time a live performance featuring Buddy Rich. It wasn’t a "Buddy Rich Big Band” however, but the "Buddy Rich Quintet". With: Sam Most on flute - Wyatt “Bull" Ruther on bass and Mike Mainieri on Vibes (19 years old and killin' it)… and I think there was a piano player to round out the quintet. Buddy played brushes, laid back sticks and played with terrific finesse on everything this group played. Plus he had some solo exchanges with Mike Mainieri that were incredible both in touch, blistering tempos and total musicianship. That band made one album; I had it at one point but not anymore. Could not find it on-line either. (a few years later I wound up playing a few gig’s myself with Wyatt “Bull” Ruther - in San Francisco. He was as solid as his nickname implied). Next time I saw and heard Buddy live, was with his big band, in San Francisco, probably around 1967 at "Bimbo’s Night Club" on Columbus St. (still there). I had a front table seat courtesy of a (then) neighbor. This band was stellar, loaded with great players, some known and some to be known. The solo tenor chair was Don Menza. Look out for fireworks when Don Menza and Buddy Rich were on the same bandstand. Buddy featured Don on some great up-tempo arrangements and at times it was just the two of them and the rhythm section. Buddy Rich played like a well-conditioned athlete on this engagement and those two guys where blowing the roof of the place. After that show I went back stage and met Don for the first time. He was really “up" after a set like that yet he spent a lot of time with me talking about his background etc... Later on I wound up playing with him a lot both in LA and Toronto and also in Buffalo NY. - his home town (in more recent years, in Las Vegas @ "Jazz at the Riviera” 1997 thru 2003 and he is also on 3 of my albums (two recorded in Canada and one in LA). Anyway, to say the least, the Bimbo’s Buddy Rich gig was a memorable night for me all the way around. Soon, after that I saw Buddy again in San Francisco, but this time playing with the trumpeter Harry James and his big band. That was a good band too and although they featured Buddy they also had listeners and dancers in this venue. I don’t mean as part of the show but if you where in the audience you could also dance to the band (if you wanted to). My parents used to do that with big bands in the 40’s and where really good dancers but by this time (1968) it was rather novel more than anything else; but the band grooved hard and it was great to see (and hear). I don’t know how long Buddy stayed with Harry James but the next time I caught him he was playing with his own band again. This time I witnessed the band around 1970 in Oakland Ca. with the "warm up” drummer. Buddy sometimes carried a drummer with him who played the 1st set with the band and then Buddy would come out and do the featured set. He would also use that same drummer to play new charts that he wanted to add to the book. He would have him read the charts down in rehearsal so he could then memorize them. Buddy could learn most arrangements and have them memorized after just a couple of run throughs. There were of course a lot of up-coming drummers who used to avoid the work of learning how to read drum charts by saying to themselves “…well Buddy doesn’t read". Good luck with that reasoning. Most of us need every tool we can master. I think if someone avoided doing something or tried to do something using Buddy Rich as an example that they were in trouble. 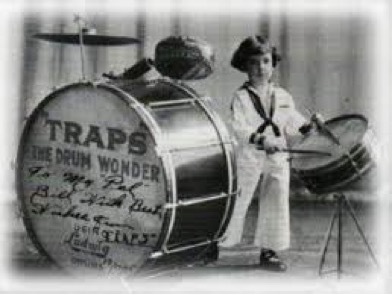 Buddy started playing professionally at 3 years old and, had he had, the time to learn how to read drum charts I’m sure he would have done so, but really, for him, it wasn’t that necessary.